Colton Sissons | Clarksville Sports Network - Clarksville Tennessee's most trusted source for sports, including Austin Peay State University. Nashville, TN – The Nashville Predators have now won back to back central division titles with a season ending win over the visiting Chicago Blackhawks, 5-2. 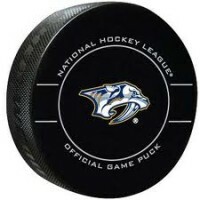 With the title the Predators are the #1 seed headed to the Stanley Cup playoffs and will have home ice advantage. The win tonight was another come from behind gem for Nashville as they found themselves down 2-0 after the first period. Brendan Perlini scored with the one-timer just three minutes into the game. Then Drake Caggiula scored at 10:07 into the opening frame and the Blackhawks had the early 2-0 lead. San Jose, CA — The Nashville Predators completed their final west coast swing tonight as they defeated the San Jose Sharks 4-2. Viktor Arvidsson scored to goals in the winning effort. 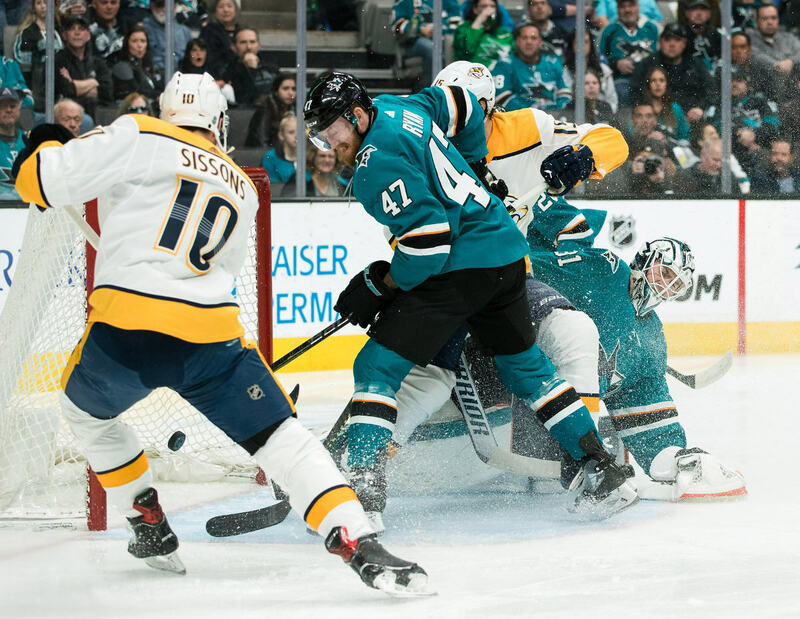 The Sharks present one of the hottest scoring teams in the NHL and the Predators knew they would have to keep them out of the net. Juuse Saros started between the pipes tonight, giving Pekka Rinne a night off. But keep your eyes on Colton Sissons who’s been playing great hockey of late. Tonight he put his Predators on the board first at 1:07 of the opening period, snatching a juicy rebound in front of the net and the Predators had the early 2-0 lead. Los Angeles, CA– Just what the doctor ordered. A big win for the Nashville Predators. 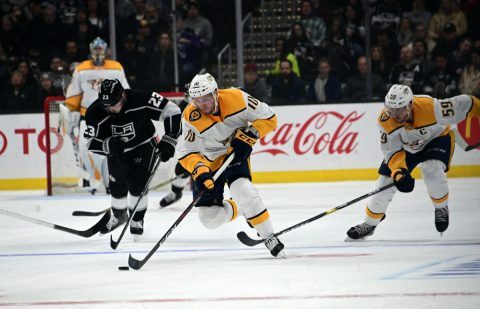 Tonight in Los Angeles, the Predators did what they needed to do with a 3-1 win over the lackluster Kings. Coming off of two embarrassing performances of late, the Predators stepped up their energy throughout the game, firing 34 shots on goal and keeping LA goalie Jonathan Quick under fire for most of the night. Viktor Arvidsson got things started for the Predators at 15:04 of the opening period when Nashville took off on an odd man rush after a Pekka Rinne save on the Nashville net. 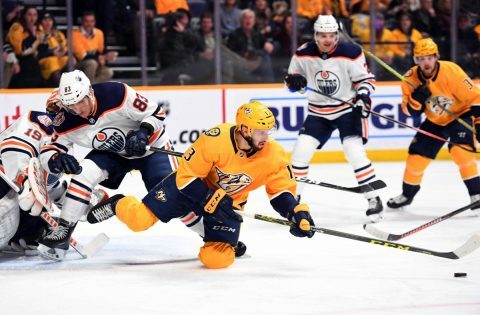 Nashville, Tn — The Nashville Predators pulled out the win in overtime tonight against the visiting Edmonton Oilers, 3-2. 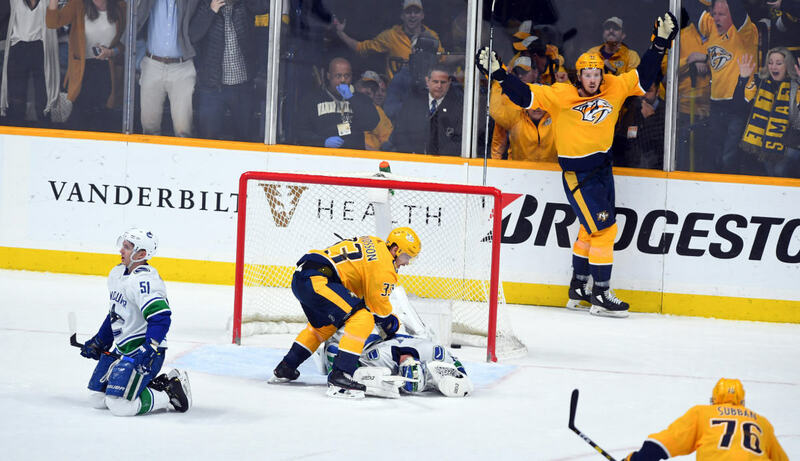 The game went to a shoot-out where new acquired Brian Boyle scored the game winner to earn the Predators the valuable extra point. 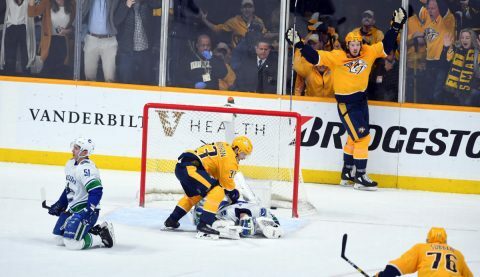 In front of country superstar Garth Brooks and hockey legend Wayne Gretzky and a fired up Smashville crowd, the Predators did what they had to do and that was fight to the end. 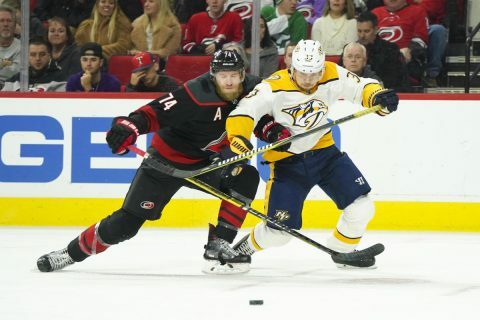 On a day that saw Nashville trade away Kevin Fiala and Ryan Hartman, for the services of Wayne Simmons and Mikael Granlund, the Predators are now set for a Stanley Cup playoff run. 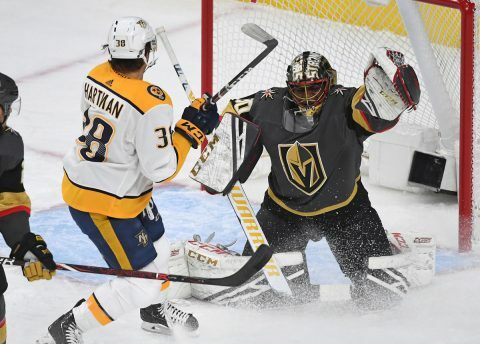 Las Vegas, NV– The Las Vegas Golden Knights ran roughshod over the Nashville Predators tonight in sin city, breaking a five game home losing streak with the win, 5-1. Nashville starting goalie Juuse Saros blocked 45 shots on the night, but Las Vegas attempted the most shots on goal for the season against Nashville with 50. The Predators thought they had the first goal of the night in the first period when Colton Sissons scored on a breakaway, but the goal was disallowed when Vegas challenged for off side. After the video review, it was determined that Sissons WAS in fact off side, so no goal. Raleigh, NC — The Nashville Predators fell to the Carolina Hurricanes this afternoon behind 21 year old Sebastian Aho’s hat trick, 6-3. The 21 year old took center stage while an old nemesis in net, Petr Mrazek, stonewalled the Predators for the win. Mrazek has beaten the Predators 7 times dating back to his days with the Detroit Red WIngs. Aho put the ‘Canes on the board at 15:44 of the first period when he took the puck in the neutral zone and beat Pekka Rinne through the five-hole for the early 1-0 lead. Columbus, OH– The Nashville Predators fought back from a two goal deficit in the third period tonight only to fall short in overtime to the Columbus Blue Jackets, 4-3. An unfortunate penalty in the OT by Viktor Arvidsson sealed the deal for Columbus as they took advantage of the power play to score the winning goal at 1:22 of the extra period. The Predators were playing this game with Pekka Rinne in net with the absence of Juuse Saros who was unavailable for the contest. Rinne doesn’t normally play in back-to-back games, but was forced into action tonight. 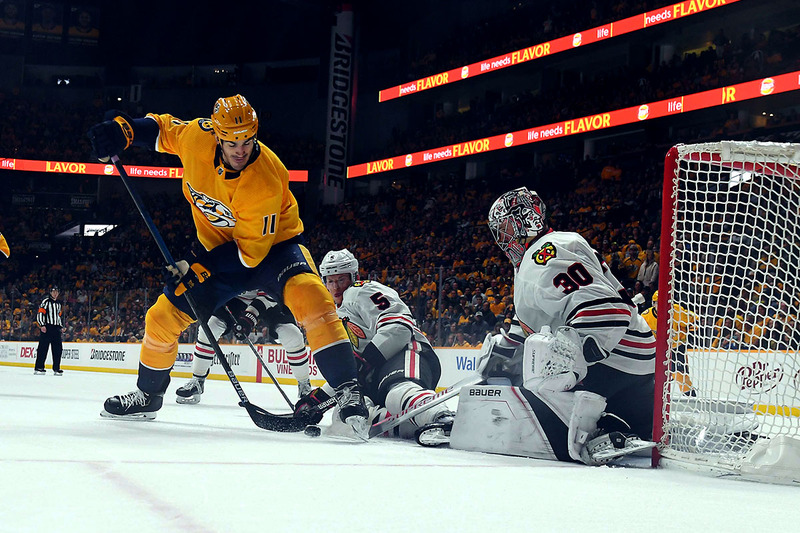 Chicago, Ill– The Nashville Predators almost let this slip away in Chicago tonight, but Filip Forsberg saved the day with his overtime winner to defeat the Chicago Blackhawks, 4-3. 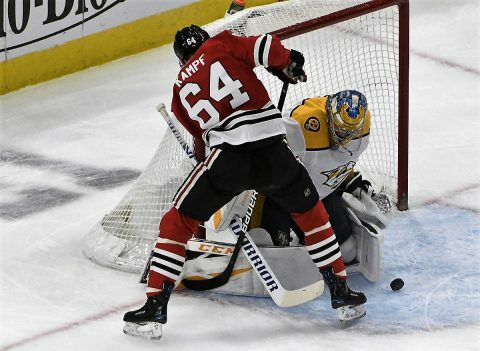 Nashville had led the entire game and looked poised to win the game when Artem Anisimov sent the game to overtime with the goal at 17:39 of the third period. Pekka Rinne was superb in net, as always, keeping the Predators in the game, stopping 34 of 37 shots on goal. The Predators had 31 shots on goal on the night. 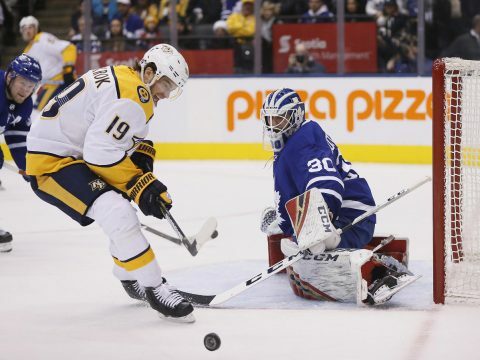 Toronto, Ontario, Can– The Nashville Predators continue to roll on this ambitious road trip, defeating the Toronto Maple Leafs, 4-0. That gives the Predators five out of a possible six points in their last three games. Nashville used a stiff defense tonight and a brick wall in net, Pekka Rinne, to thwart the Leafs. After a scoreless first period, Mattias Ekholm got the Predators on the board at 4:08 of the second period, hammering a slap shot from the point and the power play goal gave Nashville the 1-0 lead. Craig Smith and Kevin Fiala had the assists. Fiala has 7 points in his last six games.